Last night myself and Fiona, along with others from the transgender community, met at the Transgender Institute to be part of a focus group with a team of local individuals who have a plan – a plan to make a line of shoes which will specifically accommodate transgender women. This brand-new company is Freedom Shoe, and they are just right now trying to get off the ground to bring forth a line of shoes for Spring, 2015. Attending from Freedom Shoe were Pamela Williams (the entrepreneur), Ali Mazlum (the artist), and Barry Barton (the craftsman). Caroline Gibbs and Jennifer Niehouse provided creative input and expertise in the community, and overall it was a good two-hour discussion. We had a great and productive discussion last night, talking about everything from economics to fashions to manufacture to sensitivity to the transgender community. The plan is to create a line of women’s shoes with the specific fit based off of “male” shoe lasts. The company wishes to focus on transgender women at first, because they feel that it’s more challenging for transgender women to find women’s shoes which fit, than for transgender men to find men’s shoes which fit. However, they by no means want to limit themselves to women’s shoes once the business gets rolling. They also plan to ship shoes wherever someone needs them, so I’m hoping transgender women across the country will take note of this effort. Now here’s a way you could help with the direction of this group, which will only cost you a minute of time. They have an anonymous survey linked from their website which they would like folks in the community to fill out, so they can get a clearer picture of what transgender people want in a shoe. Please take a little time to help guide them, and it may in the end help all of us out. 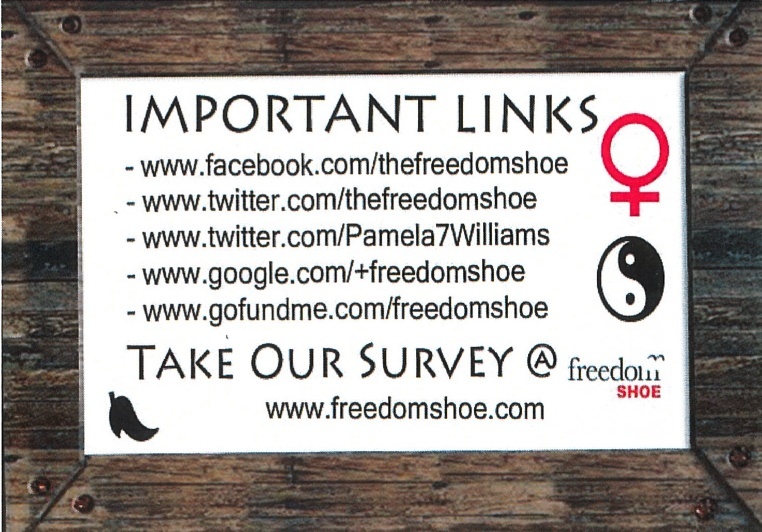 In addition, if you have interest in shoes, or want to offer suggestions or comments, please contact Pamela Williams at pwilliams@freedomshoe.com. This entry was posted in Fashion and tagged shoes on September 9, 2014 by . That comes across when Rasmussen speaks in his decidedly masculine voice. His longtime live-in girlfriend, Victoria Sage, told The Oregonian newspaper that she and Rasmussen have been an item for almost 35 years. So don’t get too concerned about the use of “him” in the article. Transgender Oregon Mayor Stu Rasmussen auctions off shoes for charity. This entry was posted in Entertainment, Politics and tagged oregon, shoes on March 21, 2014 by . Exclusive to Transas City – I’ve done research on the differences in foot and shoe sizes between women and men, in the hopes that it will give some encouragement to transwomen and transmen who worry about the size and appearance of their feet. The complete study can be viewed by clicking the link below. This entry was posted in Fashion, Medicine and tagged fashion, health, shoes on November 4, 2013 by .